Paddy Tipping , Nottinghamshire Police and Crime Commissioner. Like most Britons, my respect and appreciation for our emergency services personnel is immense following the terrible events in London and Manchester and more recently the Grenfell Tower tragedy. Graphic scenes of police officers, paramedics and firefighters running towards danger have moved us all and have highlighted the level of danger and risk these individuals face each day in the line of duty – risks which they willingly confront to protect ordinary members of the public. No amount of on-the-job training can fully prepare someone for such devastating scenes but the calmness and concentration of their work amid the chaos truly was a sight to behold. Such professionalism no doubt saved numerous lives and protected many more people from harm. I was delighted to be invited to join some of our local blue light workers recently as they tested their own resilience at a multi-agency water and land-based search and rescue exercise on the River Trent. The operation brought together the Nottinghamshire Search and Rescue Team (NSART), Nottinghamshire Fire and Rescue Service, five police Special Constables and Water Safe UK Search and Rescue Team (WUKSART). The day was based around a simulated incident involving a vehicle crashing into the River Trent at Gunthorpe Lock with five occupants. During the operation, I was invited to sit in on police briefings and accompanied the Underwater Search Team on water as they carried out their duties. I was very impressed by the way in which each of these individual specialist teams worked together and communicated so effectively to manage resources and resolve this incident. 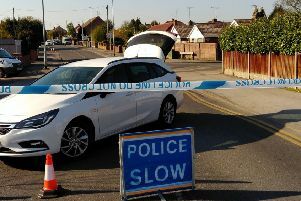 I hope that in Mansfield or Ashfield we will never be faced with an incident of this magnitude. However it is very reassuring that the expertise and resources are ready if required and that our specialist search teams are well-rehearsed to deal with such a situation. The NSART is staffed exclusively by volunteers who join the many hundreds of people in Nottinghamshire who give up their time every year to keep the public safe. We are lucky to have so many dedicated volunteers, including the Special Constables involved in this operation, who support police work and improve Nottinghamshire’s resilience and capacity to deal with serious incidents. As well as giving up their time to respond in real emergencies, these volunteers also take part in many joint emergency exercises and training programmes to test procedures and ensure we are all in the best possible position to cope with a large, complex incident. There’s a lot of partnership work going on in Mansfield and beyond to improve public safety and I’m well aware that much of this work is driven by volunteers. Whatever role our police volunteers perform, they support a much wider effort to reduce harm from our county and allow people to live in peace and the police service is incredibly grateful for their commitment.